I had heard about Chantal before I met her. It was the director of the Mylapore Festival who had told me about this French woman passionate about kolams (also called rangoli), the intricate drawings which adorn the doorsteps of many homes in India. 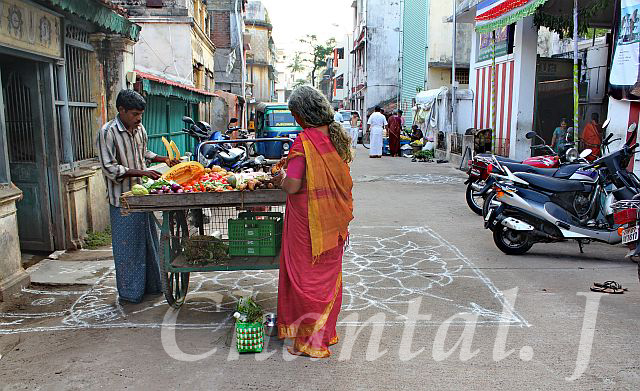 This annual neighbourhood festival features a kolam contest and Chantal is there every year, taking photographs. 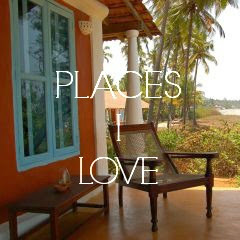 Then I came across her name more recently, while reading a book on Chennai. In a chapter about Mylapore, the author mentions a few foreigners who have a fascination for this vibrant neighbourhood and visit it every year during the Margazhi season (which falls in December) to soak in everything it has to offer. Like many other dance and music lovers, I’m also a regular visitor to Chennai every December and have been attending the ‘December Season’ since 2002. It’s not only the music and dance I enjoy, but also the lasting friendships I make with others who are passionate about the Indian arts. We were introduced by mutual friends. I have always been fascinated by the intricate beauty of kolams and so was happy to meet Chantal who has written two books on this traditional art. She also has a deep interest in Indian classical dance, having studied Mohiniattam and Kathakali in Kerala for many years. So we had many things to discuss and share. 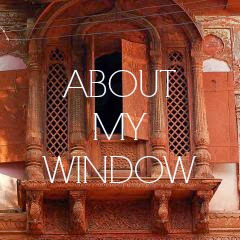 As we were exchanging mobile numbers, email addresses and website links, I was delighted when she said: “India Outside My Window, C'EST TOI? ?” So she had also had a first contact with me through my blog, which she had already visited and said she appreciates for its high quality. Thank you Chantal! With her long black braid, kohl-rimmed eyes, Indian clothes and tilak mark on her forehead, Chantal manages to blend in in Mylapore, while not going unnoticed. Many of the kolam-drawing maamis of this conservative neighbourhood have had the opportunity to meet Chantal and have their designs photographed by her over the years she’s spent studying and documenting the kolams of Tamil Nadu. Since we were both staying near the Kapaleshwarar Temple, I asked if I could join her on her early morning wanderings through the narrow streets of Mylapore on her search for the first kolams of the day. She was more than happy to have company. We don’t go far before we come across a dark figure in the half-light, stooped over from the hips, drawing snake-like interlacing lines around carefully placed dots. “This is a sikku kolam,” Chantal explains. I had seen this style of kolam many times but had no clue it had a name. The lines are formed effortlessly, creating a perfectly symmetrical pattern. But I know that drawing a kolam is not as easy as it looks. The fine rice powder is carefully ‘poured’ between the fingers onto the ground to create an even line. Some women can even draw two parallel lines simultaneously with ease. “Did you hear that?” Chantal asks me. It was the sound of a drum at a distance. “That means the procession is underway.” We rush off towards the sound, towards the Vishnu temple. Since Mylapore is dominated by the majestic Kapaleshwarar Temple dedicated to Shiva, I had no clue there’s a Vishnu temple in the same neighbourhood. 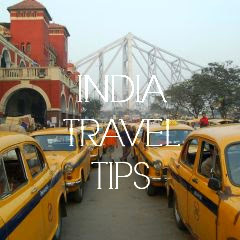 “Women draw elaborate kolams along the procession path, so we’re sure to find some elaborate ones here,” she explains. We soon find a group of temple priests carrying a statue of Andal the saint on a palanquin. 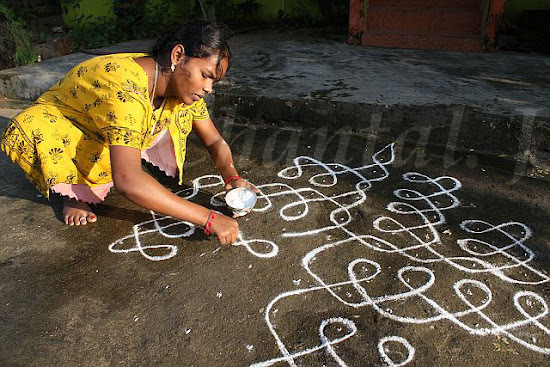 We stop to admire an elaborate kolam decorating the ground in front of a corner house. “This is an Iyengar kolam,” observes Chantal. “What’s typical about kolams drawn by this Brahmin Vaishnavite community is this ribbon-like motif,” she points out. “Come, there’s a lady who lives down this street who draws beautifully.” We head off in a new direction and on the way meet Lakshmi who’s coming back from making an offering to Andal. 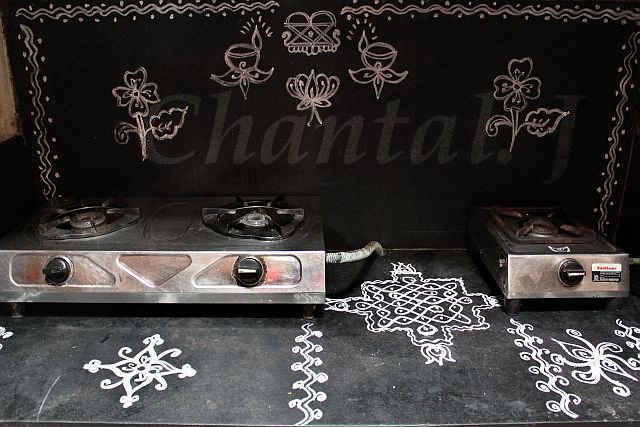 “I haven’t been able to draw a kolam this morning,” she says to Chantal, almost apologetically. “My husband is not well.” As if to make up for it, she invites us inside. Chantal is thrilled. As we climb the stairs, she tells me in French that women also draw kolams indoors, in their puja rooms and often around the stove. She relishes the opportunity to be welcomed into a Brahmin home where she can see how women decorate the spaces which are most important to them. Lakshmi shows us her puja room which is decorated with small kolams and prayers written in Tamil. 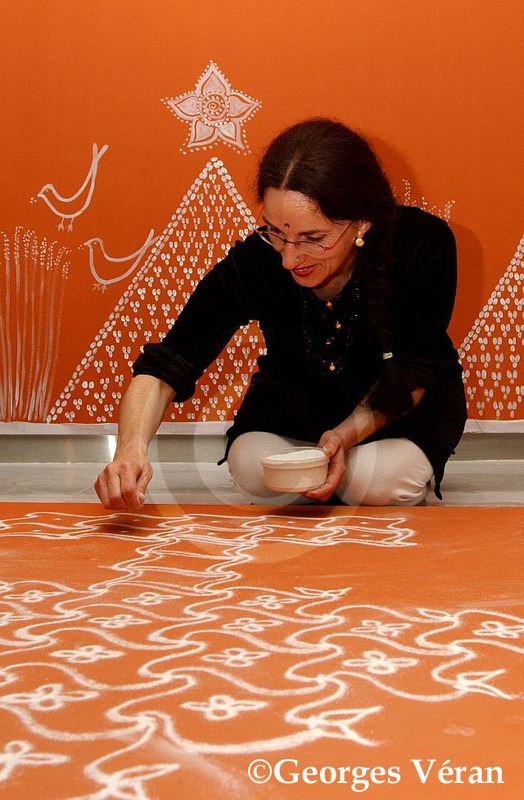 The kolam is a wonderful example of how art is used as an everyday ritual in India. The kolam is auspicious because it protects, keeping the evil eye away, and welcomes visitors and of course the gods, especially Lakshmi, the goddess of the household, who brings prosperity. 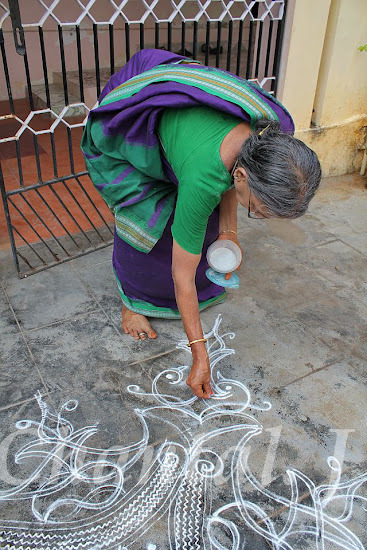 This art is handed down from mother to daughter though sometimes it’s the household help who has the task to draw the daily kolam in front of the doorstep. Chantal feels that this tradition is not in danger of dying out, but she does notice a decline in creativity with the younger generation. That’s why she thinks the kolam contest held every year during the Mylapore festival is so important, because it stimulates the imagination of its participants. She is also happy to notice that more and more young women are taking part. To learn more about Chantal’s work, visit her website. I absolutely Love walking through the neighborhoods in Gokulam and looking at the Kolams in front of the homes! They are all so creative and beautiful!